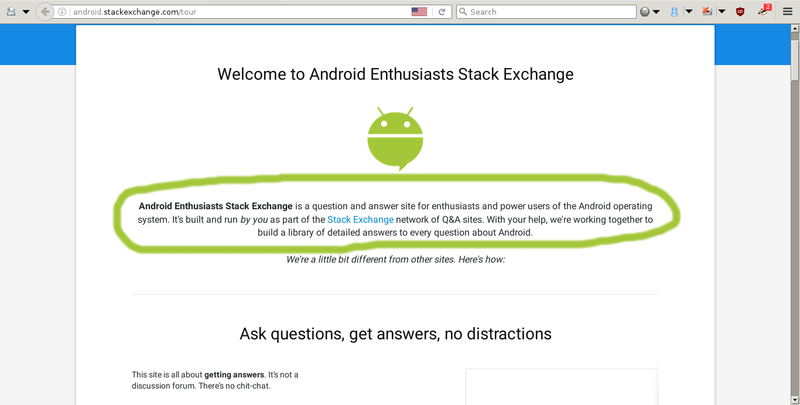 Android Enthusiasts Stack Exchange is for enthusiasts, power users, and regular people who use the Android operating system. 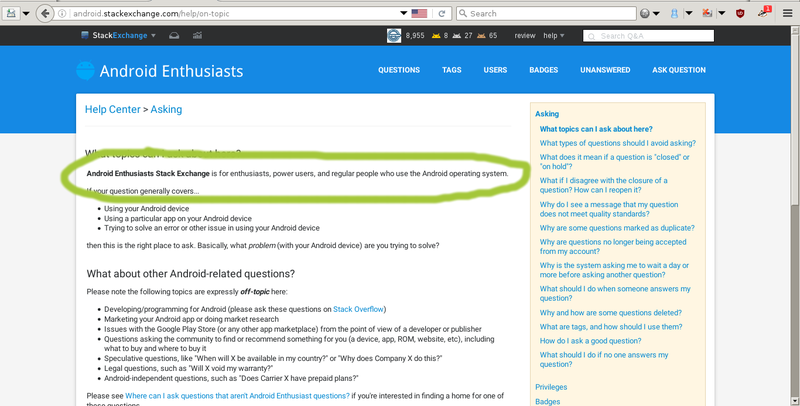 Android Enthusiasts Stack Exchange is for users of Android operating system. Per this question, I conclude that the terms "regular people" have been there for quite a long time, but I'm not sure whether the question notes the mention of the same in help center or tour in particular. "Regular people" are also welcome on this site per this post, so I don't see why the terms are missing from the tour? Surprisingly, Ask Different shares the same problem in help center and in tour. I've updated the tour and help center to both use the phrasing "users of the Android operating system". What if I have a question about Android development? Development/programming questions are not covered on this site. You can visit our sister site, Stack Overflow, instead. This is likely a result of how Area 51 instructs users proposing a new site. We're creating sites for experts. Your site should focus on pilots, not passengers; lawyers, not lawbreakers; professional photographers, not Uncle Marv with his digital point-n-shoot. If the site can attract the experts, the amateur enthusiasts will follow! So, the box "This site is for ____" gets filled accordingly, and then used for the tour of the site. Regular folks arrive later and eventually become the majority of visitors. At this point the tour may need an update.